I mentioned in my comments a few days ago that the two items on the recent Miramar City Commission agenda regarding Vizcaya Park were approved. I thought I'd share the letter that Commissioner Samuels sent to the Vizcaya Property Manager. It includes some additional details and time frame for this Phase II project. Hello, Vizcaya residents! Well, it is now official. 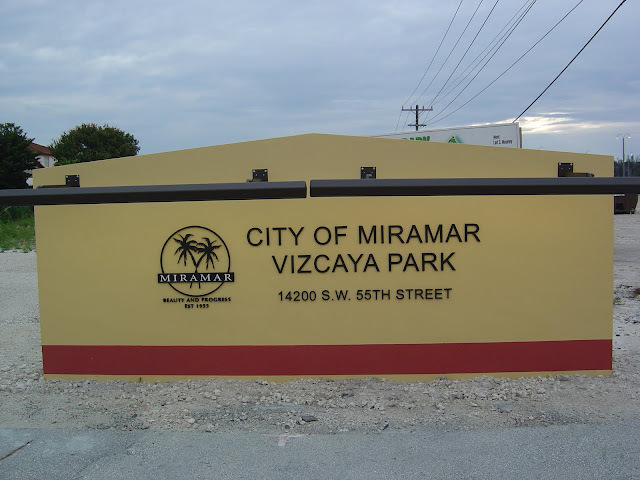 The funding for Phase II of the Vizcaya park was approved at last night's city commission meeting. First of all, let me say what a thrill it was for me to see so many of you come to last night's meeting. It was truly heart-warming to see those of you who were able to take the time from your busy schedules to be there. I received so many remarks from the Mayor and other members of the City Commission, as well as the City Manager and city staff about the great turnout from our community. You made a very positive impact with those folks last night. The type of impact that will stay with them as they consider other improvements in our area of town. I truly appreciate you being there. Phase II of Vizcaya park is rather significant. It will entail a very great majority of the amenities in the park. This phase includes a soccer/football field, two basketball courts, two pavillions, playground area, asphalt walkways, bathroom building, landscaping, irrigation and the construction of a 7,660 square foot Community Center building. Installation of electrical conduits for lighting the play fields for the entire park is also part of this phase. I believe that will leave remaining to be constructed the little league baseball field and the 2 softball fields. The total cost of this phase is $3,191,872.00. We also approved of the funding to purchase and erect the lighting for the soccer/football field and the basketball courts at a cost of $204,237.00. As it regards the construction schedule for the park, the contract reads, "Time is of the essence in the performance of the work under this Agreement. The commencement date shall be established in the Notice-to-Proceed for Phase II to be issued by the OWNER. CONTRACTOR shall commence the work within ten (10) work days from the commencement date." It then states, "The Work for the Base Bid and Bid Alternate #1 combined shall be substantially complete within two-hundred-ten (210) work days after the Notice to Proceed for Phase II Base Bid plus Bid Alternate #1 and closed out within two-hundred-thirty (230) work days after said Notice to Proceed. Ten (10) weather days or rain days are included within the overall contract time of two hundred-ten (210) workdays for Phase II Base Bid plus Bid Alternate #1." That means that we should see this phase complete practically before the end of the year. This is great news that we have waited a long time to hear. I know that I have been waiting to hear about this since 1999 and there are many others who have been waiting longer! Thanks for not giving up on me and my efforts to get this park moving. This park is one of the reasons that I decided to run for the City Commissioner position back in 2003 and then again in 2005. It is never easy in government, nor is it fast, but I am happy to see this outcome and look forward to enjoying the amenities in the park with you and your family one day soon. Thanks for all of your support. It is TRULY appreciated.